Your Gift Card will be emailed to the recipient's email address provided here. Remind me to send this card next year. Gift Card Voucher Code Here is the preview of your gift card. Please confirm that the image above is the gift card you selected, before continuing to the checkout page. TGI Friday's restaurants or its affiliates are not responsible on account of the beneficiary sharing the Instant Gift Voucher number and the Voucher getting redeemed on that account. This Instant Gift Voucher can’t be redeemed for lunch or dinner combo or any discounted promotional menus. Two promotional offers cannot be clubbed. Gift Card(s) can be redeemed ONLY on bookmyshow.com and the BMS Mobile App (iOS, Android & Windows). They cannot be redeemed directly at the cinema/venue box office. Gift Card(s) can be redeemed on purchase of tickets for Movies/Plays/Concerts/Sports or Merchandise (if any) available on BookMyShow. On the payment page, click on the "Gift Voucher" tab and enter your Gift Card code for redemption. BookMyShow Gift Cards are valid for twelve months from the date of purchase. Multiple Gift Card(s) can be used in a single transaction or the Gift Card(s) can be combined with any other payment type on BookMyShow. Payment mode will be Net Banking or Credit/Debit Card. Gift Card(s), once bought online, shall be considered as sold and cannot be Cancelled, Exchanged or Refunded. If lost or misused, the Gift Card(s) cannot be replaced. Void if resold, they cannot be exchanged for point(s) or cash and cannot be re-validated once past expiry date. BookMyShow may change (add to, delete, or amend) these terms from time to time. Unless stated otherwise, the changes will apply to any new BookMyShow Vouchers that you purchase and are for personal, non-commercial use and enjoyment only. 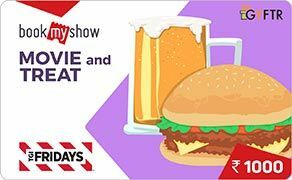 The same may be shared with family and friends, but may not be advertised, sold or used as promotional items by the purchaser or anyone else without BookMyShow's prior written consent. What is a BookMyShow Gift Card and how does it work? A BookMYShow Gift Card is a new way of gifting tickets for Movies, Plays, Concert or Sports to your loved ones. Gifting just got easy !! Prices range from INR 150 and INR 250 to INR 500 and INR 1000. The Gift Cards are valid for twelve Months from the date of delivery. Gift Cards can also be redeemed partially. Ideal as an HR incentive tool, it can be used by corporates to gift business partners or clients or as individual gifts to employees. The BookMyShow Gift Card is suitable for all gifting purposes and can only be redeemed on BookMyShow. How do I redeem the Gift Card? Log on to in.bookmyshow.com or BookMyShow Mobile App. Select Location, Event, Venue, Show Date, Time and Seats of your preference as the logic flows. On payment page, click on the “More Payment Options” and click on the "Gift Voucher" tab to enter the 16-digit Gift Voucher e-code in the text box that appears & click on "Apply" button to avail the offer. At the end of the successful transaction, Booking ID gets generated which needs to be exchanged at the Cinema/Venue Box Office for actual tickets. Email/SMS confirmation will be sent on the Email Address/Mobile Number provided while completing the transaction. How do I buy the BookMyShow Gift Card? BookMyShow Gift Cards are available through Net Banking, Credit and Debit card(s). Is there any limit on purchase per transaction? How are BookMyShow Gift Cards delivered? How long does it take? BookMyShow Gift Cards are purely "E-cards" and will be emailed to the recipients within 2-3 mins of completing the purchase. When does the BookMyShow Gift Card expire? Gift Cards are valid for twelve months from the date of delivery. For which cities is the BookMyShow Gift Card valid? Can I track the delivery of the Cards?